Kristi, an active16-year-old and avid cheerleader, was injured during a cheerleading stunt. A teammate coming down from a jump landed on Kristi’s leg. “I felt a pop in my knee and my leg went limp. I was pretty scared and I think I was in shock, “explains Kristi. An MRI showed Kristi tore her anterior cruciate ligament (ACL), a ligament in the knee, and needed surgery if she ever wanted to participate in cheerleading or any sport again. The family took Kristi to a specialist but was not satisfied with what they heard. Kristi’s dad says the first specialist recommended two options for surgery, both of which involved two surgical procedures, one to harvest tissue from another area of her body to use on the injured knee and one to correct the injured knee with the new tissue. 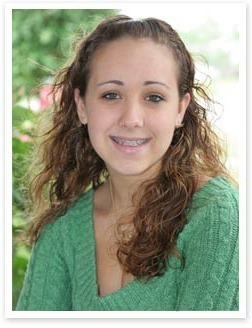 The thought of two incisions and two areas to heal seemed excessive to Kristi and her parents. Along with concerns over the two surgical procedures, he says the explanation of the surgeries and a promising outcome was unclear. Like any father, Kristi’s dad said, “I wanted a doctor who had the latest technology to provide the quickest recovery,” and that’s why they went to see Randolph Cohen, MD, pediatric orthopedic surgeon at Joe DiMaggio Children’s Hospital. Dr. Cohen presented a third option, using tissue from a donor so Kristi would not have to undergo two surgical procedures. Kristi’s dad says the family felt more comfortable with the alternative. “Dr. Cohen really seemed to be knowledgeable about the latest medical procedures offered today,” explains Kristi’s dad. The surgery was a success and Kristi was on the road to recovery. A week after the surgery, Kristi received a call from Dr. Cohen reminding her to keep up with the rehabilitation exercises. The call “made me feel like I wasn’t just a patient, but that he really cared how I was doing,” she says.